Artist's concept of NASA's Soil Moisture Active Passive (SMAP) spacecraft in orbit. One of the two science instruments aboard a NASA Earth-observing satellite that launched earlier this year has failed, agency officials say. 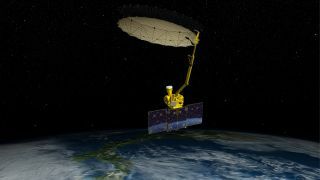 The radar instrument on NASA's $916 million Soil Moisture Active Passive (SMAP) spacecraft stopped returning data on July 7, a few months after the satellite began its science mission. The SMAP team has been unable to bring the instrument back online despite multiple attempts, and now views its recovery as unlikely. "Although some of the planned applications of SMAP data will be impacted by the loss of the radar, the SMAP mission will continue to produce valuable science for important Earth system studies," Dara Entekhabi, SMAP science team lead at the Massachusetts Institute of Technology in Cambridge, said in a statement. SMAP launched Jan. 31, equipped with the radar and radiometer instruments, as well as a 20-foot-wide (6 meters) reflector antenna that NASA officials have said is the largest of its type ever deployed in space. The satellite endured a three-month commissioning period on orbit, and then embarked on its soil-studying mission. SMAP's observations should help scientists better understand how Earth's water, carbon and energy cycles are linked and improve weather forecasts and crop-yield predictions, among other things. SMAP's mission is designed to last at least three years, but a problem with the radar's high-power amplifier knocked the instrument out in early July. Mission team members studied the glitch and performed a series of tests over the next six weeks but determined the radar was dead after an attempt to power it up failed on Aug. 24, NASA officials said. A three-day composite global map of surface soil moisture as measured by the radiometer instrument aboard NASA’s Soil Moisture Active Passive spacecraft (SMAP) between Aug. 25 and Aug. 27, 2015. The space agency has appointed a mishap review board to determine what went wrong and how such an issue can be prevented in the future. Working together, the radar and radiometer could collect soil-moisture data about regions of Earth 5.6 miles (9 kilometers) wide, and determine if soil is frozen or thawed in a patch just 1.9 miles (3 km) across. SMAP's resolution will suffer without the radar, ballooning to 25 miles (40 km) for both soil moisture and freeze-thaw data, NASA officials said. Still, "the mission will continue to meet its requirements for soil moisture accuracy and will produce global soil moisture maps every two to three days," agency officials wrote in the same statement. In addition, SMAP team members are investigating other ways that the spacecraft's radiometer data can be used. For example, the instrument can likely measure salinity levels at the sea's surface and study strong ocean winds, NASA officials said.